It's important for CIOs to realize that their counterparts elsewhere in the C-suite care about agility as much as they do, but they may not be thinking of it in terms of the IT infrastructure. Those who can map their colleagues' views of agility to how cloud models can support them can build a strong business case for cloud. Indeed, the IDG Research survey reveals that 71 percent of those who are already using cloud computing technology in the enterprise are likely to rate having a strategy and business case that aligns IT capability with business needs as critical or very important to successful cloud deployment. While it's one thing to articulate the value of cloud technology to business management, there's the additional challenge of figuring the cost. True-thanks to the cloud's variable usage model-the organization should see operational savings, but there are other factors to consider. 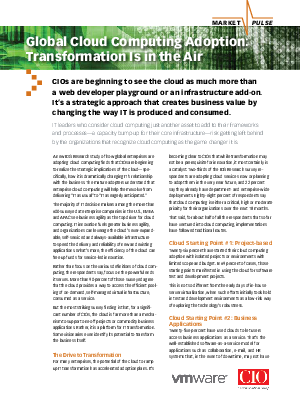 The IT leaders surveyed say they are allocating just over one-quarter of all of their IT budgets to these transformative endeavors, with 27 percent of their budgets going to software. Sixty percent say they will redeploy enterprise application and hardware/equipment budgets to help pay for cloud projects.